This post was co-authored by Marc Lindsey, President and Janine Goodman, Vice President of Avenue4. 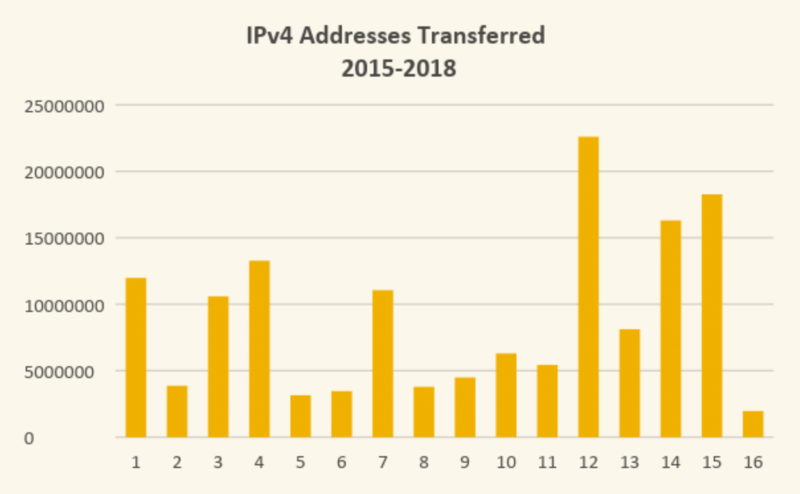 2018 was a record-breaking year for the IPv4 market. The total volume of addresses traded, overall number of transactions in the ARIN region, and prices reached their highest levels to date. 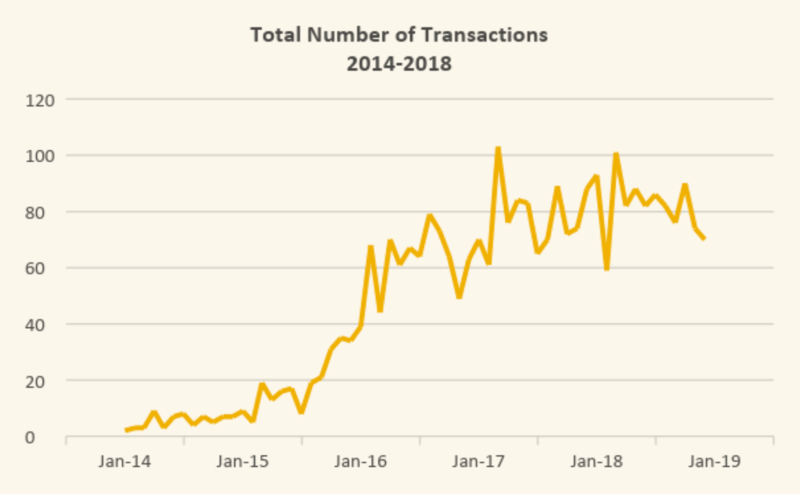 Since 2014, the number of transactions has grown considerably, mostly attributable to a dramatic increase in small block trades of fewer than 4,000 addresses. The volume of addresses sold during the same period, however, tells a different story. Between 2014 and 2015, the volume of addresses traded increased seven-fold to nearly 40 million addresses. Between 2015 and 2016, this number dropped by half. Then between 2016 and 2017, trading volumes skyrocketed again, more than doubling in the intra-RIR market and then growing by another 15% overall in 2018. This volatile pattern of activity is directly correlated to the dips and surges in available large block supply. In our 2016 report, we attributed the sharp reduction in trading volumes to both the depletion of large block supply available in the marketplace, and the decision by some large block holders to delay entering the market altogether until pricing improved. The heavy activity in 2017 and 2018 in part reflects the market's response to this large block scarcity, which impacted unit pricing across all other sectors of the market. Large blocks were trading for $6 per number at the beginning of 2016, nearly half the per unit price one might expect to pay for a /24 (256 numbers) that same year. By the end of 2018, large blocks were trading at prices in excess of $20 per number — surpassing small and mid-sized block unit pricing. Escalating prices in 2018, combined with increased buyer flexibility, prompted some new large block sellers to enter the market. For the first time, three major telecommunications carriers sold from their IPv4 inventory. The sale of over 5MM numbers from Level 3 to Alibaba was the largest inter-RIR transaction ever and helped breathe some life into an otherwise previously sagging inter-RIR market. As we've seen over the last couple of years, buyers are willing to enter into contract structures that afford sellers more time to undertake renumbering efforts required to free up their supply. And large block buyers are increasingly more willing to purchase smaller and smaller block sizes, which appeals to sellers that have substantial but fragmented unused address space. In 2018, nearly 80% of IPv4 blocks sold to large block buyers were a /16 (65,536 numbers) or smaller block size. We expect the small block sector of the market to continue to thrive over the next several years. The large block sector is, however, another matter. Although we expect additional large block supply to enter the market later this year, mostly in the form of legacy /8 address space, the available large block space is dwindling and will become a much smaller source of supply starting in 2020. And no, IPv6 migration is still not materially impacting the IPv4 market. A full analysis of the IPv4 market can be found in Avenue4's 2018 State of the Market Report. Local Time: Tuesday, April 23, 2019 07:31 AM PDT – Page Load: 0.2407 Sec.